The recent Notifiable Data Breaches Quarterly Statistics Report states that phishing is the primary cause (57%) of data breaches, with legal services being in the top 3 affected industries. The reason behind these staggering number is because cybercriminals target legal services with email-based attacks known as phishing of which the primary goal is to defraud legal practices in schemes known as Business Email Compromise (BEC). A recent Telstra Security Report found that the most common cybersecurity threat in Australia is phishing, with reports of phishing attacks increasing by 1,178% in 2017 over the previous year. A cyber attack can mean you are defrauded, have your data held to a ransom, have you and your clients’ confidential information stolen and sold on the dark web, or have all of your emails and documents maliciously deleted, permanently encrypted, or made public. 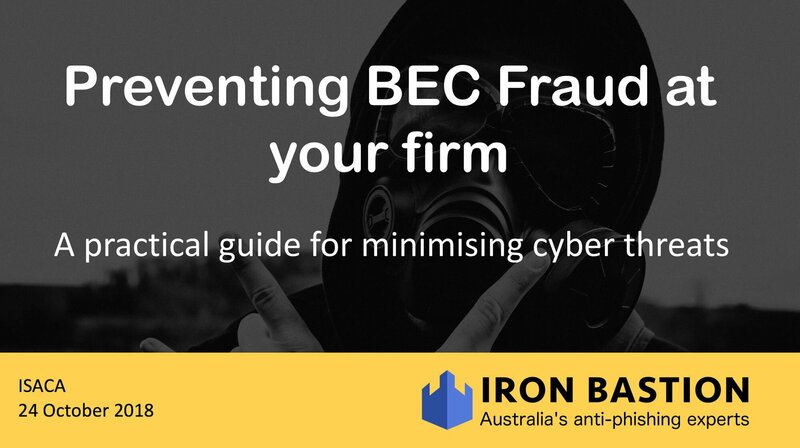 The cold, hard numbers show that Australian businesses are losing thousands of dollars every day due to BEC fraud. It is therefore imperative that all Australian businesses take better measures to protect their businesses from cyber attacks. Our cybersecurity expert, Nicholas Kavadias, was invited to speak on an industry event in front of a captive audience consisting of business owners, CISOs, IT managers and risk managers concerned about the latest cyber threats affecting their organisation. The event was organised by the Sydney Chapter of ISACA, which is an international professional association focused on IT governance. ISACA (also known as Information Systems Audit and Control Association) is a well-recognised and highly-respected resource for professional education and development in cyber risk in Australia and overseas. According to Mr Kavadias, cybercrime is a low-risk exercise for criminals compared to acts such as armed robbery. For example, whilst armed robbery is an aggravated criminal offence with an average payoff of only thousands of dollars, payment redirection fraud is low-risk and has much higher yielding pay-offs. Victims can be scammed out of $100,000 per transaction, all from the comfort of the criminal's armchair. How do cybercriminals target Australian businesses? What can business owners do to prevent their organisation from becoming a victim? Download our slide deck below to find it out. Iron Bastion are Australia’s cybersecurity experts. We provide a range of cybersecurity services protecting Australian businesses from cyber criminals and digital threats.